New York's East Village has been considerably gentrified since I wrote about it here, and one casualty seems to be Chico & Pete's string of graffiti memorials at the corner of Houston Street and Avenue B.
I've been visiting these murals every year or two since 1996, and you can see my photographs of them through the years here. When I first discovered them, the corner carried adjacent memorials to Elisa Izquierdo and Selena Perez. 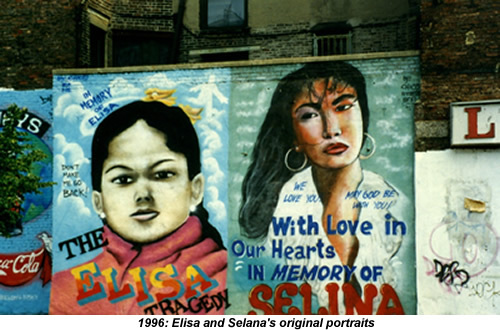 Elisa was a little girl from New York's Lower East Side who was tortured and killed by her crack-smoking mother in November 1995. Selena was a huge star in Latino music, shot dead by an obsessive fan in March the same year. By 1998, when I returned to New York, Elisa and Selena had been joined by Lady Di. 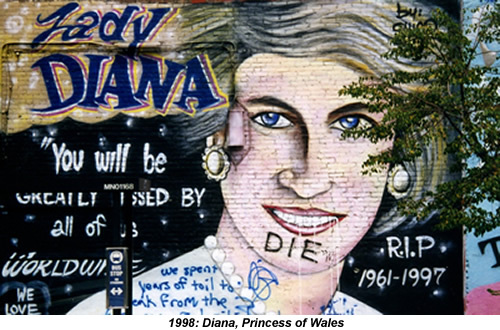 Her mural appeared right next to Elisa's, but rapidly attracted some anti-monarchist graffiti. Perhaps that's why Diana didn't last long. 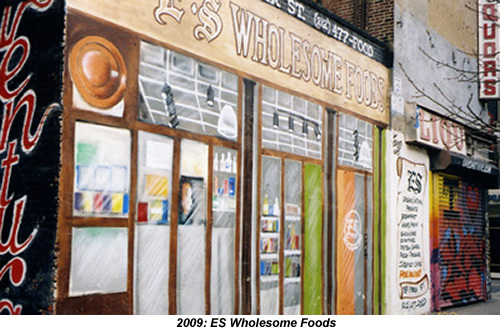 I went back in 2000, and found her mural replaced by an ad for a local animal clinic. 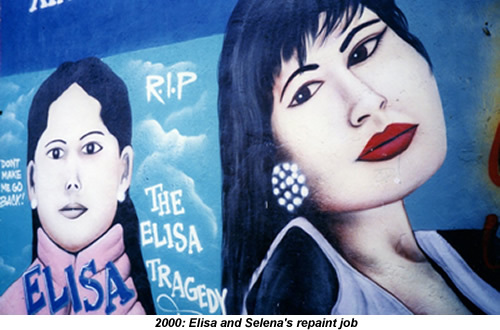 Elisa and Selena were still there though, and now repainted from scratch to keep their memory fresh. 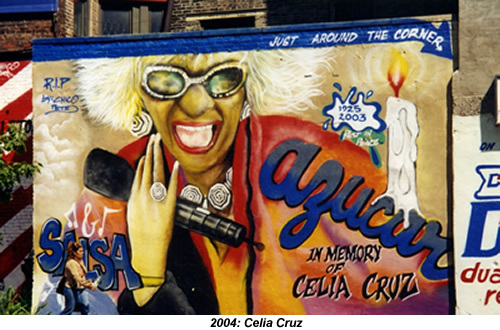 My next visit was in 2004, and this time I found Elisa and Selena replaced by Celia Cruz, another Latino music star, who'd died of cancer the previous year. 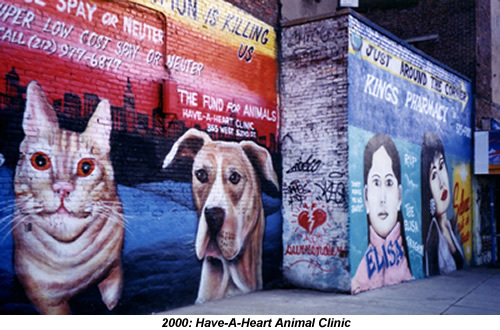 The animal clinic mural had gone by then, and that half of the site now carried a fairly non-descript collection of posters. 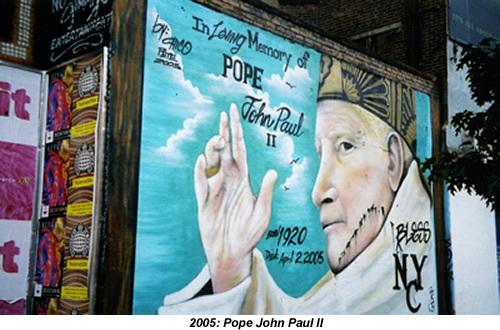 In November 2005, I made the same little pilgrimage again, and was greeted by Pope John Paul II, then just seven months dead and sporting what looked like a rather nasty shaving cut. I'm still not clear whether the choice of subjects reflects the area's own racial and religious mix, or merely springs from Chico's own interests. 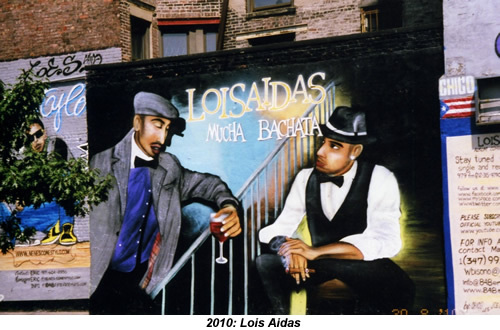 I know I'm not the only one who regards them as an East Village landmark, though, because Richard Price mentions both the Lady Di mural and the Celia Cruz one as he lists the sites passed by a carful of East Village cops in the opening sequence of his 2008 novel Lush Life. Since 2005, I've continued to visit the site every year or two, but found no more memorials there. Chico and his partners still supply work for the site, but now it seems to host only their advertising murals for various New York bands or local stores. 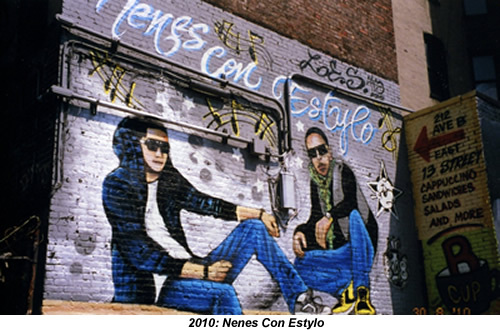 The latest residents are Nenes Con Estylo ("Los Capitanes de Reggaeton") and Lois Aidas. 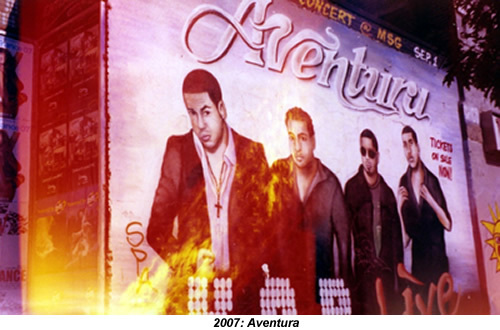 Neither of these duos, nor the boy band Aventura who'd preceded them, show any interest in the outlaw/rebel credentials which you'd think a graffiti campaign might offer. With their designer clothes and red wine or cigar props, they look like they'd much prefer a glossy poster campaign. I don't begrudge Chico & Co the loot of course, but I can't help thinking something's been lost in this move from urban street art to just one more advertising medium. New York is a slightly duller place for the change.